At one of the most important museums outside London - The Bowes Museum in the picturesque North Pennines market town of Barnard Castle. Purpose built in the 19th Century, this captivating French style chateau has a charming and romantic history to tell, involving its founders, wealthy businessman John Bowes and his beautiful Parisian wife Josephine. John, a successful entrepreneur and legendary racehorse owner, was also illegitimate. His uncertain social status left him something of an outsider in English society, and he spent an increasing amount of time in France, furthering his interest in the arts. While in Paris he courted and married Josephine, whom he met after buying the theatre where she was an actress! A talented amateur painter, she was interested in a wide range of art forms including ceramics, furniture and textiles. It wasn't long before the couple's shared love of the arts led to the idea of creating a world class museum back in John's home town, with the aim of allowing ordinary people access to art. John and Josephine filled their Museum with wonderful treasures. At every turn there are important and precious works from all over Europe, including paintings by El Greco and Goya; the only works by these artists outside national collections in London and Edinburgh. At The Bowes Museum today the couple's vision continues. The addition of a suite of ground floor galleries has recently been joined by a stunning Silver & Metals Gallery, a state-of-the-art Fashion & Textile Gallery, a fabulous European Decorative Arts Gallery and a specially created, generously proportioned exhibition Gallery. Visitors can learn about John and Joséphine's wonderful story while marvelling at the fascinating collections and acclaimed exhibition programme. The parterre gardens can be enjoyed for their own sake or for the many and varied outdoor events taking place at regular intervals. These include annual Theatre Productions, Summer & Christmas Markets and storytelling. 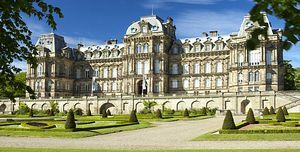 A wide range of indoor activities, the highly-praised Cafe Bowes - described by one critic as 'The best museum food in the North East' - and the popular gift shop have all played their part in bringing The Bowes Museum singing and dancing into the 21st Century. The magnificent legacy that John and Josephine Bowes left has been cared for to retain its charm and romance, while sympathetic developments continue to make it a popular, vibrant and exciting day out for all ages. The Summer 2011 highlight is the exhibition Painting Flowers, which runs from 16 April until 9 October. It offers a superb opportunity to view the first large scale exhibition in Britain to celebrate still life paintings of Henri Fantin-Latour and the Impressionists. Other works include paintings by Renoir, Courbet & Vollon. The Bowes Museum is situated on Newgate in the picturesque market town of Barnard Castle. There is ample free parking on site, with coach and accessible parking bays. 17 miles fron Darlington rail station. Bus services run regularly to Barnard Castle from Darlington (Compass Royston Travel 70)(Arriva 75 & 76), Bishop Auckland (Arriva 8) and Richmond (Hodgsons 79). Call Traveline on 0871 200 2233.